But that’s only USA I hear you say…Sorry it’s a worldwide network and largely the same everywhere. 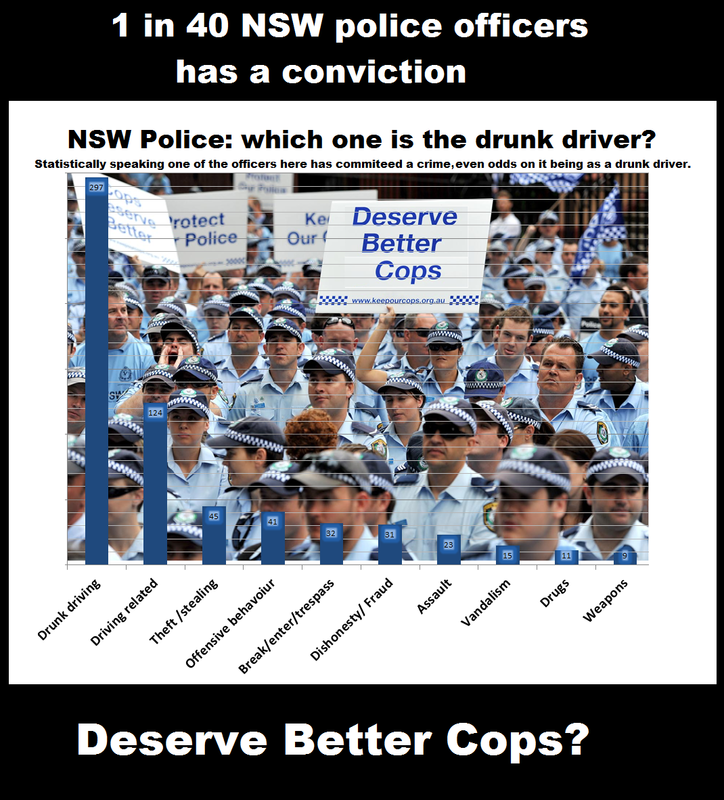 Well lets have at look at the level of criminality and dishonesty in NSW Police. 1 in 40 members of NSW police force have a criminal conviction, we are not just talking about their proclivity for drunk driving. We are talking about serious offending. Why are they still police? GIPA document listing criminal convictions held by NSW police officers. It’s not a good story without a specially crafted infographic to compress the story to a single tantalizing image. * Some of the police pictured above may be innocent, yeah its a crazy world, not so long ago we had a Jewish Hitler youth as Pope. For the whiny police who have a union but spend plenty of time breaking up other protests, offenses were grouped together into rough categories for conceptual simplicity, so don’t cry into your beer while driving home tonight. Posted on August 22, 2014, in Australia, Meme, Mock and Awe, New South Wales, Police, Whistle Blowers and tagged conviction, Crime, NSW Police, Richard McDonald, whistleblowers. Bookmark the permalink. Leave a comment.